These were little placoderm about 20 to 30cm with a maximum size of 1m. Antiarchs are characterized by the fact that their pectoral fins are enclosed in bony tubes (pectoral appendages). Most had segmented arms and a head shield that featured a single opening in the middle for the eyes and nostrils. The trunk shield was long relative to the overall length. Antiarchi�s were unique in that they had a trunk shield with two plates along the back (median dorsal plates). The front end of the antiarchs looked quite bizarre. The body was encased in a bony box that had flat sides and bottom and an angled roof. Toward the front of this box and sticking out from each side was a pair of bone-covered appendages that looked like crab legs wit a bony joint where they met the body. At the front of the box was a bony helmet with a central opening that contained both eyes, which protruded like those of a frog. Sinolepidoids (meaning �Chinese scale� forms) were a peculiar group of big-headed antiarchs with long segmented pectoral fins only found in China. Recently however a sinolepid was discovered near Grenfell, New South Wales, Australia and was named Grenfellaspis. 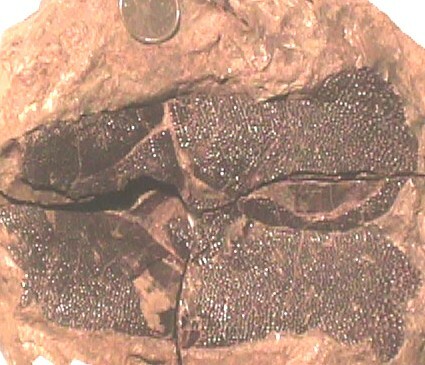 This fossil provides evidence that the Chinese and Australian terranes came into close proximity enabling migration of fish faunas during the late Devonian. The most successful groups were the bothrolepidoids and the astrolepidoids which flourished during the middle and late Devonian. The asterolepids first appeared in marine environments from which they invaded freshwater river and lake systems. By the end of the Devonian they were pushed out of the competitive marine world and became freshwater river and lake dwellers. The Bothriolepis (�pitted scale�) were little placoderms with long, segmented arms. They were very widespread and have been found in Devonian rocks of every continent including Antarctica. Bothriolepis had a special feature on its skull which was a separate partition of bone below the opening for the eyes and nostrils enclosing the nasal capsules called a preorbital recess. Serially sectioned specimens of Bothriolepis show that inside the armour the fish had paired lung-like organs and a spiral intestine, preserved full of organic sediment differing from the sediment type surrounding the fossil. It was quite probably a mud-grubber that ingested organic-rich mud for its food. Its long pectoral appendages could also have been used to push itself deeper into the mud for feeding. However, another suggestion is that the fish used its long arms to walk out of the water to invade new pools free from predators and full of rotting vegetation. 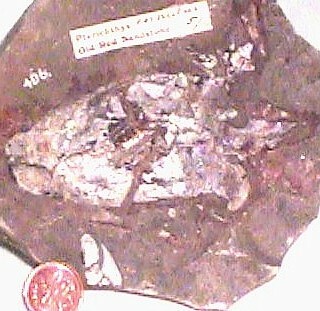 Bothriolepis is known mostly from freshwater deposits which they must have invaded through shallow seaways as well as rarer marine sites such as the Devonian reefs at Gogo in Western Australia.